There’s an episode of Seinfeld in which George’s boss at Play Now wants him out and makes his working conditions miserable in hopes that he’ll quit. Lately, it almost seems that’s what Joe Girardi has been trying to do to Alex Rodriguez — embarrassing him at every turn on the off chance he snaps, retires on the spot, and lets the Yankees out of the last five years of his megacontract. Of course, that won’t happen, but we at least thought that A-Rod had been so thoroughly humiliated during these playoffs that his October couldn’t get much worse. What we hadn’t accounted for, however, was embarrassment that didn’t stem from his manager’s strategic choices. And so, today, the New York Post, citing an unnamed witness, brings us a story about how A-Rod, after he was pinch hit in the eighth inning of Game 1 of the ALCS, “openly flirted with a pair of pretty women two rows behind the dugout — even sending them a ball bearing a note asking for their phone numbers.” Our favorite part of the story, by the way, is how the witness says that A-Rod stopped flirting when Derek Jeter got hurt. If this all really went down the way the Post says it did, then it’s hard to feel sorry for A-Rod, even as the details of his in-game flirting spread across the Internet. But A-Rod’s just had one of the worst weeks of his professional life, and now this joins the greatest hits of A-Rod tabloid stories, just a notch or two below the one about his alleged centaur painting. 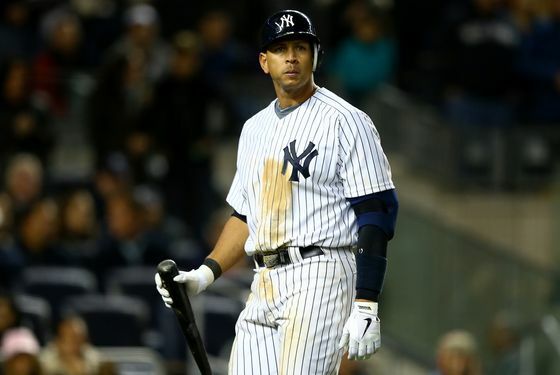 We say this as one of A-Rod's last remaining fans, but man, it really is always something with this guy, isn't it?